We've detected that you might be using an outdated browser. While the site will be fully functional, we recommend upgrading for the best experience. Here’s what you’ll experience as part of this high-caliber 10x Program. Dan Sullivan’s 10x Program is an extraordinary environment for the accomplished entrepreneur looking to fast-track their biggest, boldest goals yet. It’s for the ultra-focused entrepreneur who wants to work on their sky’s-the-limit goals right now—and already has the means and drive to skip ahead and get started. 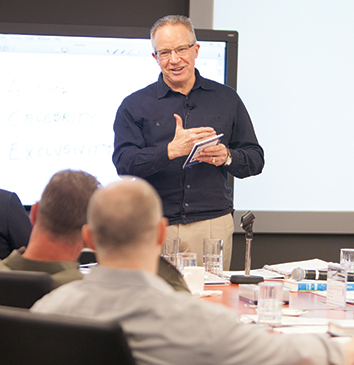 Your 10x Ambition journey starts with your workshop with Dan, a leader among leaders, whose ideas provide a new perspective that shakes things up and gets things moving—big time. You’ll work directly with the founder and creator of Strategic Coach® and have access to Dan’s latest thinking, innovative ideas, and fast-track strategies for achieving exponential results in pretty much any area of your business and life. Going 10x can’t be done alone. A focus in Dan’s workshops is on building and effectively leading your version of a Self-Managing Company®, with an emphasis on multiplying. While you learn how to multiply what you do, your team will learn to multiply everything else that’s needed to reach your goals. The Self-Multiplying Company™ that emerges keeps you, and your team, excited about and engaged in your future vision and the goals that will get you there. In Dan’s 10x Program, you’ll be in a room of other extraordinary entrepreneurs from a range of industries who are all up to very big things and dedicated to going for the 10x goals that excite them most. It’s an atmosphere that hums with vision, energy, and innovation. Also in the room every workshop is your dedicated Program Advisor who supports you and your progress on the workshop day and also between workshops. Dan’s key team leaders and project managers also sit in on his workshops and become a great resource for you. Imagine one day every quarter away from your business, where the only focus is on you and your biggest-yet ideas and goals. “Thinking tools” open up your mind, solve roadblocks, and get planning under way, right down to your first actions when you’re back at work. It’s a rare and stimulating place to be for any entrepreneur who’s ready to kick their exponential adventure into overdrive. As a 10x Program participant, the Golden Ticket is your all-access pass to any of our Signature Program workshops in any city (subject to availability). AND, as a special bonus, for your first two years in the 10x Program, we’ve created an exclusive bootcamp session that takes place the day after your workshop with Dan. 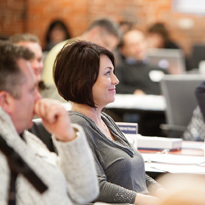 This scheduled second-day workshop is a structured Golden Ticket designed to make sure you get the foundational Coach tools that will support your 10x journey. After your second year, you’ll have the flexibility to choose the Golden Ticket workshops that are most relevant and convenient for you. You’ll learn how to use core Strategic Coach implementation strategies that will build on your new multiplier way of thinking from your workshop with Dan. They’re designed to help you take your new ideas and make them real. Build Your Foundation: These key Coach strategies can produce amazing results once you start implementing them in your business: more control of your time, extraordinary teamwork, and greater clarity on how you create the greatest value for everyone around you. You’ll also create a 90-day action plan to get you started and keep you on track. Collaborative Coaching Experience: You’ll have access to additional Strategic Coach experts, including our Entrepreneurial Teamwork Strategist and coach, Shannon Waller; your Program Advisor; and our amazing team of Program specialists. Strengthen Your Workshop Community: Sharing and discussing ideas is a key part of your Coach workshop experience. This second day with your group gives you an additional opportunity to strengthen your connection with this unique community of entrepreneurs. You’re setting up all the right conditions for exponential 10x growth and expanding your freedom as an entrepreneur. Be sure to add both of these power-packed days to your calendar. 10x Team Calls: Tune in to exclusive 10x Team Calls hosted by our Entrepreneurial Team Strategist, Shannon Waller. You and your team can listen in to these quarterly calls, get aligned on your 10x goals, and learn how to create the teamwork to achieve them! We’ll also host a couple of special 10x interviews during the year to keep you and your team connected. Strategic Coach® Online: You’ll have access to our extensive, interactive, customized client website, where you’ll find tools (writable or printable), audios, boosters, and relevant articles, plus mini-coaching videos with Dan and our other coaches. Your “Golden Ticket”: As a 10x Program participant, it’s your all-access pass to any of our Signature Program workshops in any city (subject to availability). It’s your opportunity to deep-dive into our concepts and tools, gain a fresh perspective, and experience workshops with other coaches and participants. Once you start your workshops, your Program Advisor will be able to help you find a workshop that is the best fit. Exclusive 10x Facebook Group: If you’d like to be part of the bigger conversation of 10x entrepreneurs at Coach, search Facebook for “strategic coach official 10x group” and request to join. Consider this group your one-stop shop for cutting-edge thinking, mastermind-level conversations, new ideas and tips, fellow 10x entrepreneurs’ wins, great advice, links to new resources, and lots more. Ready to launch your 10x journey? Dan Sullivan’s 10x Program awaits. Experience is everything. All our entrepreneur coaches are also successful business owners and long-time Strategic Coach Program participants. Our events are a terrific opportunity to see whether Strategic Coach offers the 10x experience you imagined. We’ve designed both our live presentations and our webinars to expose you to Strategic Coach thinking and tools to help you determine if we’re aligned with who you are and where you want to be. Our Starter Kit has everything you need to know about how The Strategic Coach® Program works and how it could work for you. TM & © 2005-2017. The Strategic Coach Inc. All rights reserved.